�The Creature from Jekyll Island��that is what the Federal Reserve is known as in some circles. The name comes from a book called, of course, The Creature from Jekyll Island by G. Edward Griffin. The book is a favourite of libertarians, conservatives, and conspiracy theorists because it claims that the Fed is the root of all evil, given its ability to finance wars, spark economic booms, and create depressions. So, what is Jekyll Island? In 1910 a group of old-boy American financiers met on Jekyll Island off the coast of Georgia to discuss monetary policy and out of it spawned the legislation that created the central bank�the Federal Reserve. Despite the name, Jekyll Island is actually a lovely place with white-sand beaches and a beautiful landscape. Triggering the meeting was the concern over a series of financial crises that had befallen the markets. The most noteworthy were financial panics that occurred in 1901, 1903, and 1907. But before that the U.S. and the world had gone through what was known as the �Long Depression� of 1873�1879. Actually, the �Long Depression� was two deep depressions with the golden age of railroads in the middle. There were banking panics in 1873, 1884, 1890, 1893, and 1896. The second depression ran from 1893 to 1897. Despite the depressions, the period from roughly 1870 to 1900 was known as the �Gilded Age.� Not surprisingly, wealth inequality soared during this period. The banking panic of 1907 was a financial crisis spread over a 3-week period as the NYSE fell about 50% and there were runs on numerous banks and trusts. The panic would have been worse except for the intervention of J.P. Morgan who put up huge sums of the banks money to prevent a bigger collapse. The key, however, is that it led to the creation of the Federal Reserve System with the Federal Reserve Act passed in 1913. The Fed is responsible for monetary policy through three tools: open market operations, the discount rate, and reserve requirements. It is responsible for helping to maintain a healthy economy and full employment, and to keep inflation in check. Through open market operations the Fed buys and sells securities. Hence the huge role the Fed played in the 2008 financial crisis even as its balance sheet ballooned from $800 billion to $4.5 trillion. Quantitative easing (QE) was open market operations on steroids. The Fed (FOMC) has 12 members. Seven are appointed governors including the Chairman, the president of the New York Fed, with the remaining four coming from the other eleven Federal Reserve banks on a rotating basis. The FOMC meets eight times a year, the most recent being March 19�20, 2019. Currently, there are two vacancies. This past week, President Trump nominated economist Stephen Moore to the Fed Board of Governors to fill one of the vacancies. Moore is an outspoken critic of Jerome Powell and a close colleague of Larry Kudlow, President Trump�s economic advisor. Moore has been an outspoken critic of the Fed�s interest rate policy. Assuming he is approved by the Senate, Mr. Moore would still only be one vote amongst 12. This past week was dominated by the Fed. The Fed surprised many with its dovish report. The Fed surprised when it stated it had no plans to raise interest rates further in 2019. The Fed is concerned about the potential effects of Brexit, a slowing global economy, particularly in the EU, Japan, and China, possible collapse of ongoing trade talks with China, and even some signs of slowing in the U.S. Recent quarterly GDP numbers bear out signs of a slowing economy. Existing home sales have been sliding for months although new home sales have been mixed. Housing starts have also generally been sliding despite a big bump in January. We note GDP and existing home sales below. The Fed also announced they would end the drawdown of their bonds in September. What that means is that quantitative tightening (QT) will be no more. The markets reacted. After some hesitation, stocks took off. 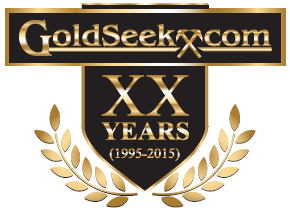 Gold took off at first but when the U.S. dollar bounced back gold sold off. Yields fell and�no surprise�the 2�10 spread narrowed further. (See under Recession Watch Spread Page 15.) The 2-year U.S. Treasury note has been in a downtrend now since peaking last November. The 2-year has, in some respects, been leading the market towards the dovish stance of the Fed. Other central banks chimed in their concern about the slowing global economy as well. The United Kingdom is careening towards a no-deal Brexit�or maybe they will get lucky and get an extension. Nonetheless, Theresa May�s tenure as PM seems to be slip-sliding away. No matter what happens, Brexit is a disaster. That the Fed is ending its rate hikes came as a surprise because it was only in December 2018 that they suggested two more rate hikes in 2019. Now, none. Our suspicion is that Fed knows the global economy is headed for a hard landing but they can�t say that. Friday�s sharp down day in the stock market was a response to signs of a slowing global economy and that the 10-year Japanese Government Bonds (JGBs) and the 10-year German bund all went negative. As well, we note the 3-month Treasury bills � 10-year U.S. Treasury note spread turned negative. While these are negative signs, remember we are still early and, in the past, there were at least 6 months of negative spreads before the economy turned down into a recession. The well-followed 2-year�10-year spread remains positive, but did turn down again this week. For the record, Canada is also slipping as the GDP monthly chart shows below. So, a potential slowdown is not just limited to the EU, Japan, and China. It is spreading in North America as well. But these things take time. And a reminder that in a slowing economy that�s when the accidents occur in the form of a fund going bust, a large dealer in trouble, or a bank in trouble that could spread. A major �black swan� event is most likely months away, but things can change fast. In any case, we�ll always have the Creature from Jekyll Island. But will he and the other central banks be able to save the day once again? On Thursday, stock markets appeared poised to take off as both the S&P 500 and the NASDAQ leaped to new highs for the current move. Stock indices were responding positively to the Fed�s dovish stance of no further rate hikes and the end of QT in September 2019. 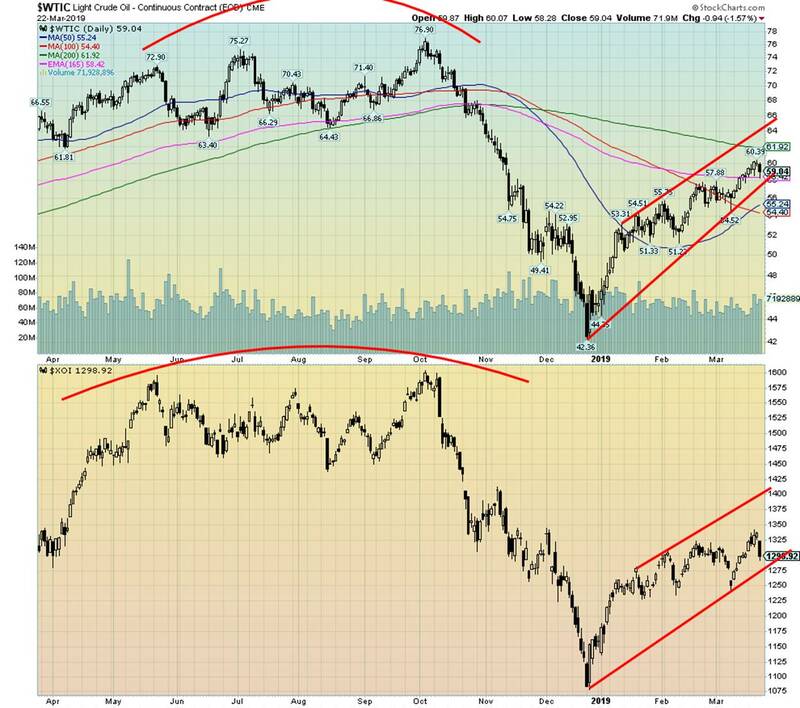 On Friday, that was all reversed as a spat of economic numbers from Germany in particular were weak, Brexit appeared headed for the rocks, and German and Japanese 10-year bonds went negative. The result was the Dow Jones Industrials (DJI) fell 460 points (1.8%) with a sharp uptick in volatility. So, what happened with the run to new all-time highs? It hit a bump. Time will tell whether this is a fatal bump or merely a forming correction to the sharp run-up seen since the lows in December 2018. On the week the S&P 500 fell 0.8%, the DJI was off 1.3%, the Dow Jones Transportations (DJT) was hit hard falling 2.5%, while the NASDAQ dropped 0.6%. 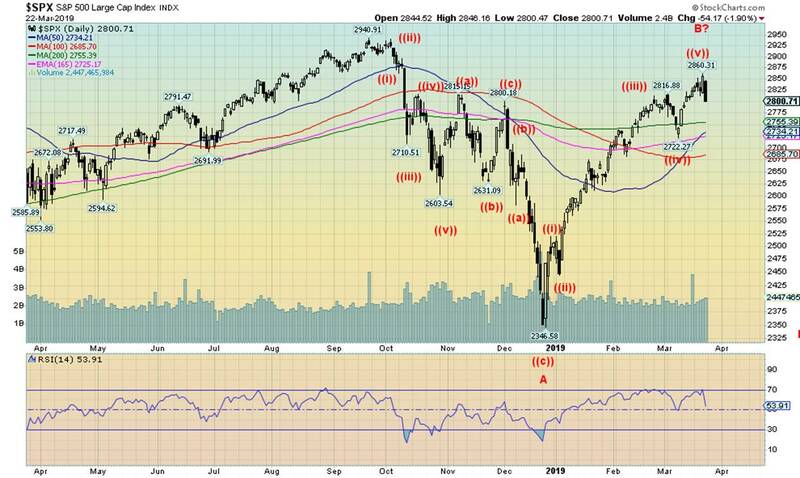 Given that both the S&P 500 and the NASDAQ hit new highs for the current move, Friday�s action constitutes a reversal day, although the highs were made on Thursday. Elsewhere, the small cap Russell 2000 dropped 3.1%, the TSX Composite fell 0.3%, but the junior TSX Venture Exchange (CDNX) put in a positive week, gaining 1.6%. So, what to make of the reversal of fortune seen on Friday? Expect the volatility to continue into next week. 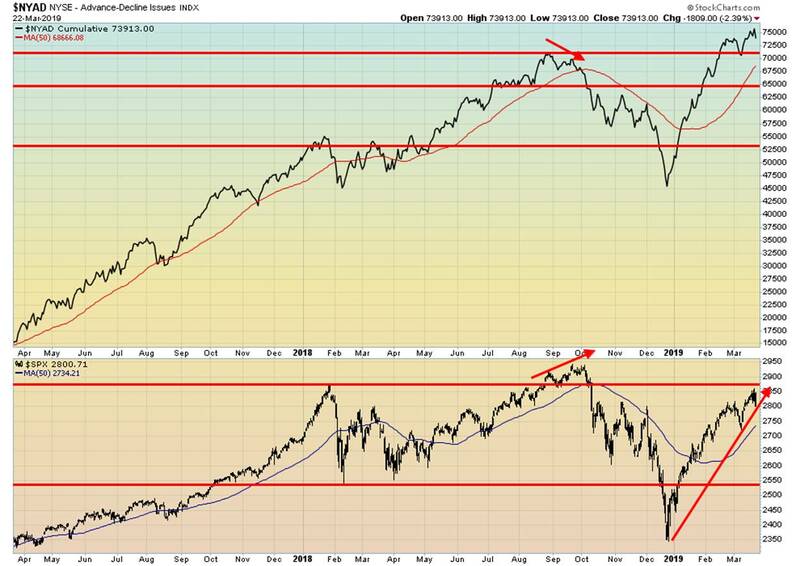 And it is probable the indices will fall further. There is considerable support for the S&P 500 between 2,700 and 2,750. A break below 2,700, while giving off potential sell signals on the daily charts is not necessarily a fatal move. Of bigger concern would be a break under 2,600, and below 2,450 new lows could loom. The break for the S&P 500 over 2,825 was supposed to signal a potential move to new all-time highs. However, the breakout was not confirmed by the DJI nor the DJT. The NASDAQ broke as well to new highs for this move. This divergence has, for the moment at least, shifted the focus to the downside. Does this mean the market is finished and we are doomed to crash to new lows? No, it does not. The fact that some spreads went negative and the JGBs and the German bunds turned negative does not signal that a crash is about to occur. But it does signal that the first signs of a potential recession are now upon us. In the past, it has taken more than one reading of negative yields and spreads to suggest an impending recession. Most likely we are anywhere from three to six months away from that and at this point we are not even guaranteed we�ll see a recession. Here is the S&P 500, the DJI, and the DJT. Note how the S&P 500 made new highs but was not confirmed by the DJI. The DJT wasn�t even close. Watch the relationship between the DJI and the DJT going forward for major divergences. Wow! A 10.2% drop in just four days for the KBW Bank Index (BKX). It is probably no surprise that banking stocks fared the worst with the Fed�s dovish tone. If a recession is coming, it also suggests that bankruptcies and delinquencies will rise which in turn puts pressure on the Bank�s loan portfolio. As well, thoughts of lower rates also mean lower spreads for the banks. The KBW Bank Index topped way back in February 2007. The recent high in 2018 fell short of the 2007 high. We are in a world where debt has accrued exponentially since 2008 and the banks have a lot of it on their books. We also note the KBW Bank Index was down 28.7% at its low in December 2018. That was well above the general markets� 19% decline. The bank stocks were in a bear market. Even now they are still down 18%. Beware the banks. For Canadian banks we note that the TSX Financials (TFS) fared better than the KBW. Unlike the KBW, the TFS saw its all-time high in January 2018 at a level well above its high of 2007. At its worst in December 2018 it was down 17.5%. This past week the TFS fell 1.5%, nowhere near the hit the KBW took. Canadian banks are much better capitalized and while they may suffer in a downturn, the odds of one of them going under is nil. They also regularly increase their dividends. The materials dominated TSX Composite lost a small 0.3% this past week. As it has done in the past, it will follow the U.S. markets to the downside. 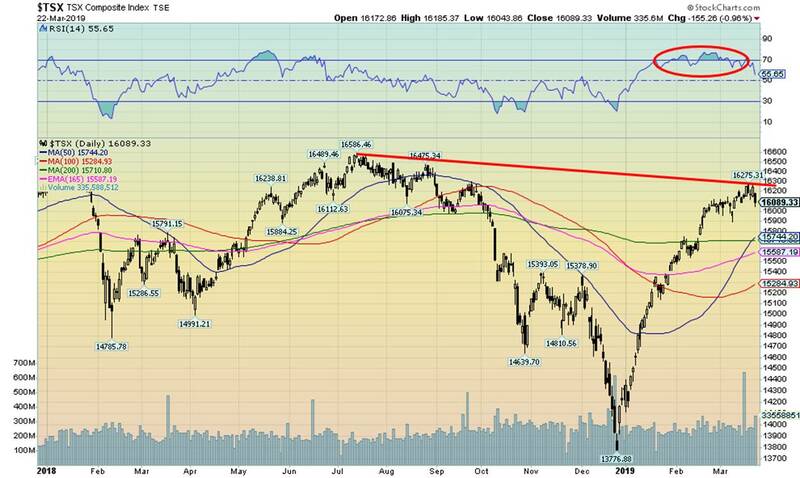 The TSX has solid support just below 15,800 and down to 15,300. Below 15,200 would spell trouble and likely a severe test of the December low. We note the Income Trust sub-index and the Real Estate sub-index moved to new highs this past week and didn�t follow the market down. Other indices that look positive are golds, materials, and mining. 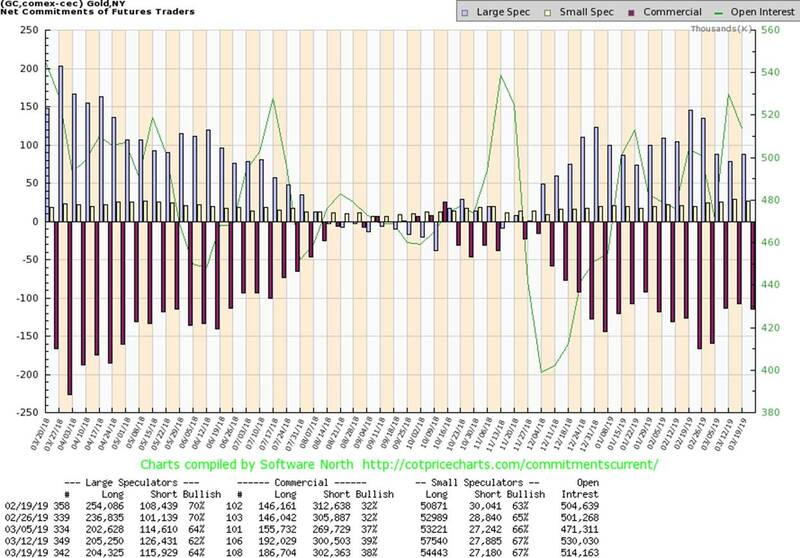 It has been some time since we showed the TSX Venture Exchange (CDNX). The CDNX is made up of roughly 50% junior mining stocks, but you would also find health care, energy, cannabis, consumer, and other stocks on the exchange. The CDNX is up 14.5% so far in 2019. Grant you, that is after a disastrous year in 2018 when the CDNX fell almost 44% from its January 2018 top. Many junior mining stocks were down even more, with some falling 90%. So, the current rally is welcomed. This may be the beginning of a stealth rally. We note the pickup in volume since this rally got underway. It has a long way to go. There is considerable resistance up to 650, but over 700 the index should perk up. Remember the CDNX can give off both great gains and great losses. After a horrible 2018 the CDNX looks poised to put in even more gains. Bond yields continue to fall in the wake of the dovish tone adopted by the Fed. In some respects, given that the decline in yields got underway last October, the bond market has been leading the Fed. The question now is, is the bond market spent and will the fall in the yields will come to a halt? The daily RSI indicator has dropped below 30, a level that often signals that a low could form. It was last below when the 10-year U.S. Treasury note fell to 2.56% in December. If you have been long 10-years above 3%, then it might be a time for some profit-taking. It is possible for the 10-year to fall further, but at 2.44% it is hitting a band of resistance from previous declines. Below 2.30% the 10-year could take a run at the 2017 low of 2.05%. The all-time low was seen in July 2016 at 1.37%. With the fall in yields this past week, our recession watch spread (10-year Treasury note minus the 2-year U.S. Treasury note) fell to 13 bp from 16 bp the previous week. Unlike some others, this spread is still not negative. It remains above its December low of 11 bp. A recession call would come when we see the 2�10 spread turn negative and remain so for at least 3 to 6 months. This spread is nowhere near signaling a recession just yet. We believe the markets will calm down and realize that their fears are overblown � at least for the moment. The 3-month U.S. Treasury bill and the 10-year U.S. Treasury note spread turned negative this past week. That had pundits jumping up and down screaming �recession� and the stock market tanked 400 points. For the record, the 3-month 10-year spread turned negative a good year or more before the start of the 2007�2009 recession. It first went negative in February 2006. The spread actually bottomed in February 2007, well before the stock market peaked in October 2007. So, the pundits� screaming is, we believe, premature. The pundits were screaming even louder about the 10-year German bund turning negative. It is down sharply from a peak back in January 2018 of about 77 bp. This week�s low was at negative 2 bp. Like its Japanese counterpart, the 10-year bund was negative in 2016, hitting a low of about negative 19 bp. 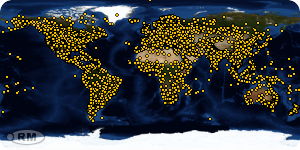 At the time some pundits were screaming it was the �end of the world.� Not quite. The 10-year bund recovered and hit a peak of about 77 bp in January 2018. There have been definitive signs of slowdown in Germany as some German economic numbers this past week were not encouraging. One of the big concerns was the manufacturing PMI falling to 44.7% in March 2019, a level well below the expectation of a reading of 48%. Export orders have been falling. PMI levels below 50 are considered recessionary. The PMI fell below 50% in January 2019 and has remained below that level ever since. Germany is also trying to engineer a merger between the deeply troubled Deutsche Bank (DB) and Commerzbank, Germany�s second largest bank. That would create a banking behemoth, considering Deutsche Bank is already a substantially sized bank. But the merger itself has been troubling. DB is saddled with a large number of Italian debts. Not a good place to be, considering the troubles with the Italian banking system. DB also has Russian loans and, apparently, even loans to the Trump organization. DB also has an extremely large derivatives portfolio which could prove troublesome. Could DB collapse? It has been mentioned numerous times, but its size alone brings considerable attention from both the Bundesbank and the ECB. In all of the screaming over bonds and spreads turning negative, we wonder why the high-yield junk bond spread hasn�t moved higher. Maybe the current concern is overblown. Note how the spread on the high-yield junk bonds started moving higher in 2015, well before its peak in 2016. If the rise in spreads follows the path of 2015�2016, then the spread has probably bottomed and should start rising over the next few months. We�ll keep an eye on this one. Wither the U.S. dollar? We freely admit that the past few weeks have been confusing as to the direction of the US$ Index. It looks down, but it also looks up. But that is the frustration of these type of patterns. They are complex and give off all sorts of signals, none of which seem to make sense. That line at around 95.50 seems to hold. It was tested as the index dipped down to a low of 95.17 but then rebounded and is now above 96 once again. We note in following Elliot Wave International (www.elliotwave.com) that they too have been fighting trying to make sense of the pattern. The best call now is that the US$ Index has made a rather complex ABCDE-type pattern, thus forming a B intermediate wave up from the low of February 2018. The A intermediate wave topped out in August 2018 labeled (A). If this is correct, then a C wave up should soon get underway. That would take the US$ Index to new highs, possibly up to around 100. Breakdown points remain at 95.50 and especially at 94.50. Gold responded positively this past week to the dovish Fed, but Friday�s drop in the stock market saw gold only rise a small $4.40. The $1,320 to $1,330 zone is resistance, but above $1,330 a push to $1,350 would take place. Gold breaks under $1,300. Silver remains in a nice uptrend. However, our expectation is that silver should follow gold to the downside. It would be interesting, however, if silver held the channel line and fell no further than around $15.15. If $15.15 were to fall, then a decline to the $14.30 to $14.50 zone could be underway. As with gold we expect this could be final low for silver. 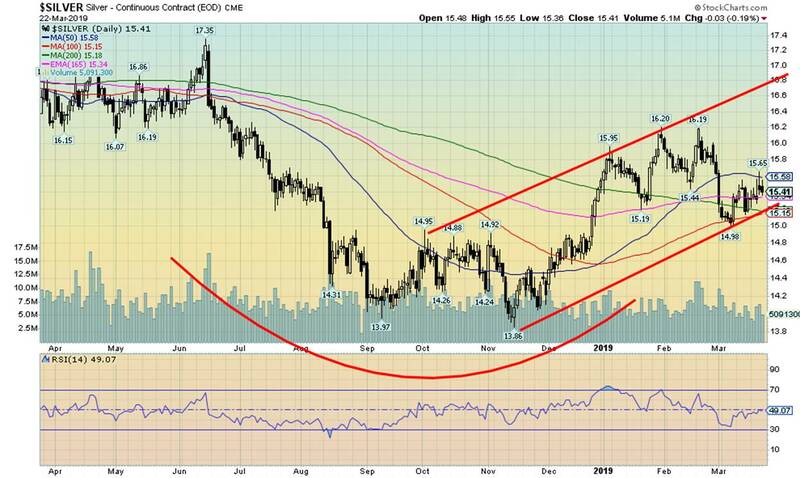 Silver�s breakout spot is around $16. A breakout above that zone and especially over $16.50 could suggest a move to $23.50. Gold stocks did well this past week. They were up on Friday even as the broader stock market fell sharply. 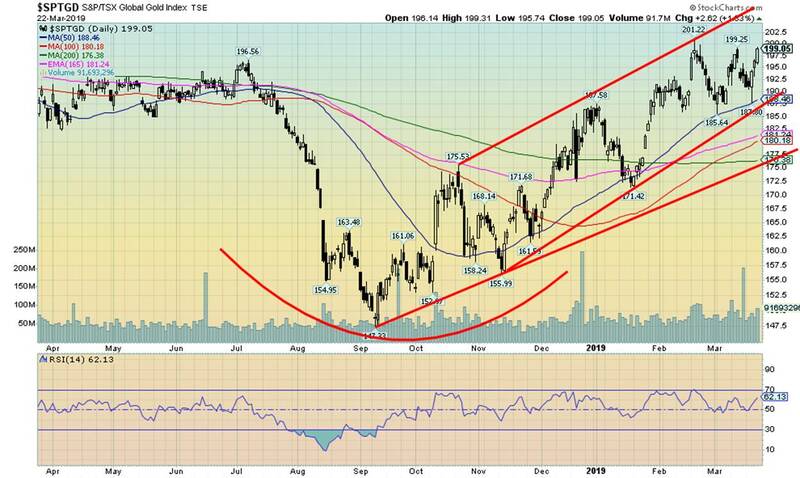 The TSX Gold Index (TGD) rose 2.9% on the week and the Gold Bugs Index (HUI) was up 2.2%. The TGD made a zig-zag pattern from the low of 147 in September to the high of 201 in February. Since then, the TGD has been in a choppy pattern of down, up, down, up. Whether the TGD makes a new high here or not is moot. The pattern suggests the TGD should eventually fall back once again. Below 188.50, a decline to trendline support at 170 is possible. Volume has typically fallen off on this up move. 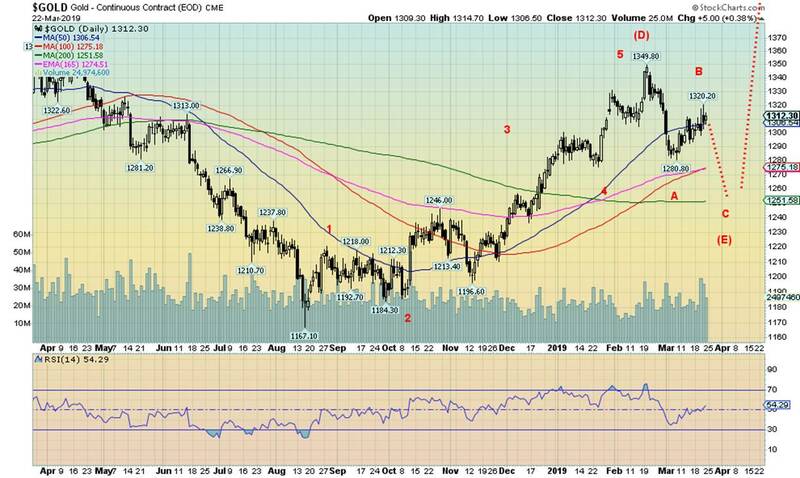 If gold and silver were to fall as we suspect, the gold stocks should follow to the downside. 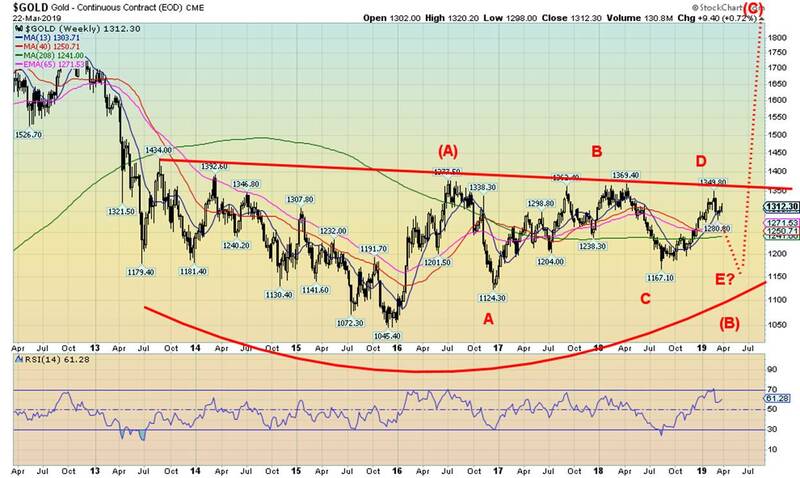 But, as with gold and silver, we believe it will be a final low and then a powerful rally could get underway. WTI oil rose to a high of $60.39 this past week, but on Friday it followed the stock market lower. We�d love to see WTI oil rise to the top of the channel near $64, but Friday�s drop was brought on by thoughts of a slowing economy. However, we are soon approaching the major driving season. As well, despite threats, OPEC and Russia have not increased production to put pressure on U.S. shale producers. Of course, it all depends on what is being called the NOPEC legislation whereby it would allow the U.S. government to sue the OPEC cartel. 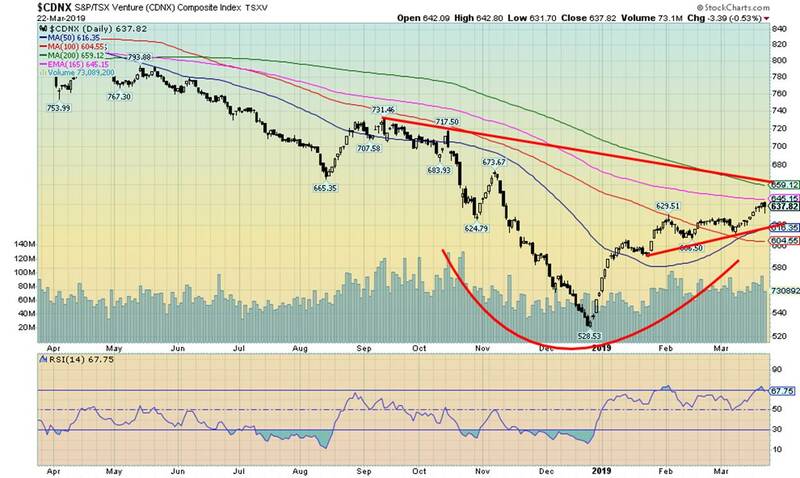 It has been said that if that were to happen, OPEC would flood the market with oil pushing down the price of oil. That would put pressure on the highly leveraged shale producers. If WTI oil failed to hit the top of a channel WTI oil could be forming an ascending wedge pattern which is bearish. 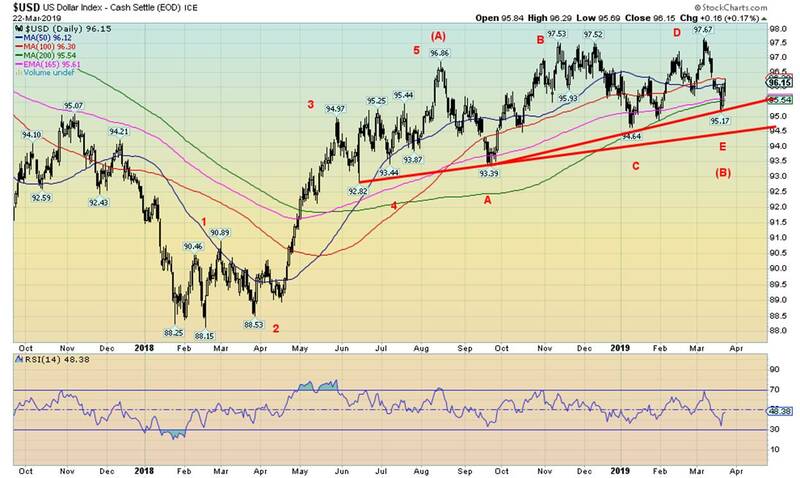 It starts to break down under $58 and under $54 a bigger sell-off could be underway. The energy stocks reacted negatively on Friday along with the broader market. The XOI breaks down under 1,275. The pattern that has formed appears as a wedge, so any bullish expectations are limited. We have constantly heard from central bank officials and finance officials expressing concern about the level of household debt here in Canada. The latest figures from Q3 show Canada�s household debt to GDP is 100.7%. (Note: you usually hear about it in relation to income, but measuring it to GDP is also quite valid). That�s above the levels seen in the U.S. before the 2008 financial crisis. We also read that 46% of Canadians are a mere $200 from insolvency if a household member lost a job. The U.S. household debt to GDP hit a peak of 98.3% in Q1 2008. From there it has been downhill and it currently sits at 74.8% in Q4 2018�still high, but not quite as drastic. Still it is high and also highly imbalanced. As in Canada, many are merely a job loss away from serious financial trouble. Corporations have also gorged on debt. Here is the ratio of corporate debt to GDP. Note how it has peaked each time before a downturn. And not only has it peaked but it did so at increasingly higher levels. The late 1980s boom saw it peak at 65%. The dot.com bubble�s peak was also seen at about 65%. It went higher for the housing bubble in 2008 with the peak seen in Q4 2008 at 72.5%. This time it has exceeded all the previous peaks, currently at 73.9% in Q3 2018. We suspect it is probably higher now. Nonetheless, it is not a positive sign.